Now there's a way to eliminate those laborious folding, stuffing and sealing chores. The Print to Mail™ accessory automates office mailings like payroll checks, accounts payable checks, statements, invoices, grade reports, student schedules and W-2's. 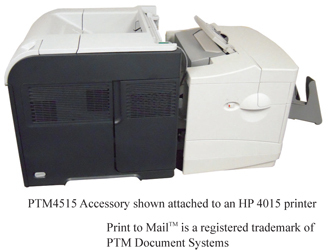 The Print to Mail™ accessory attaches to the HP Laser Jet 4014/4015/4515 series printers, folding and sealing the printed document in one easy step, at a rate of up to 65 pages per minute (printer dependent). With the lowest cost in the industry, the Print to Mail™ is affordable to any size business or organization. 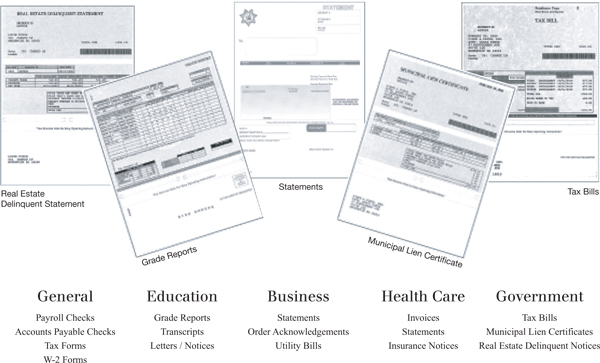 Print to Mail™ forms replace both the envelope and the paper used with conventional mail and can reduce your mail preparation costs up to 50%. ( Results may vary based on the number of mailers and process used to produce them. ) Print to Mail™ forms are available in a number of different formats to cover a wide variety of office mailings and totally eliminate the time consuming, manual steps of folding, stuffing and applying postage. In addition to the traditional folding and sealing application, the Print to Mail™ accessory can be used as a folder for promotional materials or other office correspondence requiring a standard or windowed envelope. We can help you format your forms and create a customized Print to Mail™ system for your own application(s). Now you can turn your HP Laser Jet printer into a complete mailing solution - easily and affordably. Your private information stays private and your mailings always look neat and professional. The Jet Link, developed by HP, controls the flow of paper between the HP Laser Jet 4014/4015/4515 printers and the Print to Mail™ unit. If a jam occurs anywhere in the printing, folding or sealing process, the Jet Link will pause both the printer and the Print to Mail™ until the cause of the jam has been corrected. Once cleared, the printer will automatically reprint the miss-fed forms without restarting the print job. Print to Mail™ is the only true one step fold and seal solution. PTM Document Systems guarantees that the forms we produce for use with the Print to Mail™ hardware will fold and seal perfectly. We can increase the efficiency of your Print to Mail™ hardware by applying years of production experience to the manufacturing of your form. Incorrectly manufactured forms can cause equipment failure and poorly sealed documents. We stock a wide variety of checks and forms as well as producing custom forms to meet your particular needs. PTM Document Systems offers the highest quality form with a 100% guarantee of Print to Mail™ compatibility. To learn more about how Print to Mail™ can make an impact, contact us at 866.667.2861, fax us at 707.527.9230, or simply check out our website. Rollers have a manual advance and access panels make media removal simple. Communications package stops printer if a jam occurs. Senses operational status of Print to Mail™. © Copyright 2019 Print-2-Mail - PTM Document Systems All Rights Reserved.